(7/20/2011) This page describes research I carried out back in high school (1993) for my Extended Essay as part of the International Baccalaureate program. While the overall quality of the work is poor by my current standards the subject of sunscreens and protection from the sun's radiation is even more important now than it was almost 20 years ago and I didn't want to just throw my original paper away. What you see here, with the exception of transcription errors and typo corrections are my exact words from 1993. Unfortunately I only had a digital copy of an early draft of the manuscript, so the text was not complete and I was missing several figures. I took a picture of each printed page with a digital camera and used the Tesseract OCR package to extract the text of the final version. This worked extremely well and saved me a lot of boring typing time, but I'm certain that a few errors still persist. I am less satisfied with the images of the missing figures, which are simply cropped photographs. One day I may scan these in properly and clean them up. If you have any questions or comments please feel free to me. Whatever you do though, please don't ask me why I had separate categories from graphs and figures! I could change it now, but that doesn't seem right. The sun has long been a source of energy, but recently it has come under scrutiny for the potential hazards of it's ultraviolet rays, namely skin cancer. Sunscreens are available to protect us from the sun, but only recently have they been seen as more than burn protection. This has raised the question as to how effective sunscreens are, and whether or not they really provide adequate protection from the sun. The focus of this project was to, through the use of UV-Visible spectrophotometry, quantify the absorption of sunscreens. Due to the nature of the spectrophotometer, it was necessary to dissolve the sunscreens in solution. This meant that a suitable solvent had to be found. A range of solvents was tested and it was discovered that two alcohols, isopropanol and methanol, were the most appropriate. The next step involved determining the effect of concentration on the absorption of sunscreens. Two different methods were used; different masses of sunscreen proportional volumes of solvent, and dilution of a stock solution. The latter was most effective and the data conformed to a direct linear relationship. To answer any questions about SPF factors of sunscreens, a range of SPF's from the same manufacturer, as well as the same SPF from different manufacturers, were compared. SPF factors are in fact only a relative measure of a sunscreen's power, and are more confusing than helpful. Among the different manufacturers, the range of absorption and ingredients are more important than SPF. Finally, all of the above data was correlated to conditions similar to those on human skin. 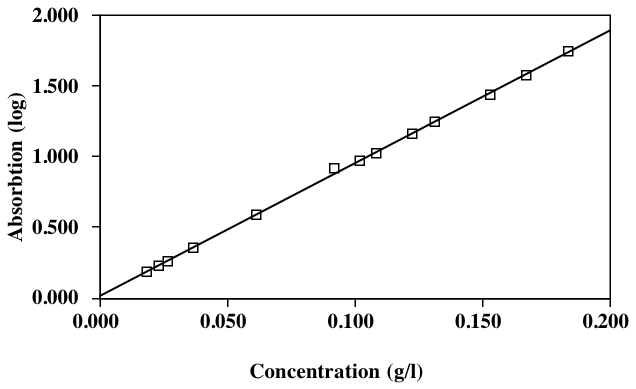 The amount to surface area ratio was calculated, and referenced against concentration data. The actual absorptive ability of sunscreens turned out to be very high. Ingredients took on a major role, as they were responsible for an increased range of absorption. Sunscreens can be an effective method of sun damage prevention, but they must be applied with care and knowledge to reach their optimum performance. Since the dawn of man, the sun has been respected and revered as a source of life and energy, and a symbol of benevolence and prosperity. Recently however this reputation has come under scrutiny. Instead of the greatest benefactor, the sun has become the main culprit in one of the most recent medical concerns. Current research links the sun and it's ultraviolet rays to almost every form of skin cancer, especially malignant melanomas. Because the sun is such a common factor in one's life, the risk of skin cancer is very real. Furthermore, depletion of the ozone layer at the hands of CFC'c and other chemicals has heightened the anxiety about the risks of UV light. The ozone layer is the main bastion of protection against UV rays, and rifts in the ozone layer allow more and more ultraviolet light to come in contact with the earth and one's skin. These latest discoveries have prompted the growth of a sun- protection industry. In previous years sunscreens were used merely by the fair-skinned for the prevention of burns. Now, however, their protection against UV rays is advertised as a possible life saver against skin cancer. Many refinements have been made in sunscreens to lessen the chance of skin irritation and afford better protection against the entire ultraviolet spectrum. Yet, even with all of these advancements, many questions have arisen. Am I safe from skin cancer if I wear sunscreen? What does SPF mean, and which one is right for me? Do sunscreens really work? This paper will endeavor to shed some light on such questions, which represent very real worries of today's society. Sunscreens are a widely used and highly touted innovation, yet little is known about their actual effectiveness at preventing sun-induced damage to the skin. This project will focus on sunscreens' effectiveness in absorbing UV rays, and demonstrate at which wavelengths they are most effective. The UVB region of the ultraviolet spectrum was previously considered as the only culprit in burns and cancer. but recently UVA and even the visible spectrum have proven themselves to be just as dangerous. In addition, a range of SPF factors will be tested to compare their effectiveness and the possible advantages of a supposedly greater level of protection. Properly used sunscreens can be of a great benefit, but first one must understand them and be confident in their effectiveness. The experiments were performed during the period ranging from March 29 to August 22, 1993. All experiments were performed by the author, at the University of Alberta, Medical Sciences Building. The questions to be addressed are as follow: Do sunscreens actually protect the skin from the sun's damaging rays? What do the different types of sunscreens and different SPF's really mean? Ultraviolet light is the fraction of the light spectrum at wavelengths shorter than 400 nm. It is invisible, yet responsible for a variety of harmful effects to human skin. There are three sections of UV light: UVA (320-400 nm), UVB (280-320 nm) and UVC (<280 nm). UVA and UVB both contribute to the occurrence of malignant melanoma in the skin. UVB damages the cell's DNA directly, whereas UVA promotes cancer when absorbed in the melanin, both of them inciting the production of active oxygen species. UVA is responsible for over 90% of sunlight related skin cancer cases1. In addition, UVB is responsible for the tanning and burning of skin, a condition known as erythema. Thus an SPF of fifteen means that a person who can normally stay in the sun for twenty minutes before getting burnt can now stay in the sun for 5 hours. It is however important to note that the SPF is only a measure of the effectiveness in absorbing UVB rays, and the ability to absorb UVA rays can vary greatly with each individual sunscreen. Indeed, until recently, sunscreens were composed with the sole goal in mind of protecting against burns. The idea of protection against skin cancer has come about as a result of the depletion of the ozone, even though this phenomenon will have little effect on the incidence of skin cancer due to UVA radiation. A logarithmic absorption scale is employed, such that an absorption (A) of "one" indicates 90% of the light is absorbed, and an absorption of "two" indicates 99% of the light is absorbed. To achieve these figures, the following relationship is used; A=log10(Io/I), where (I/Io)(100)=%transmission. 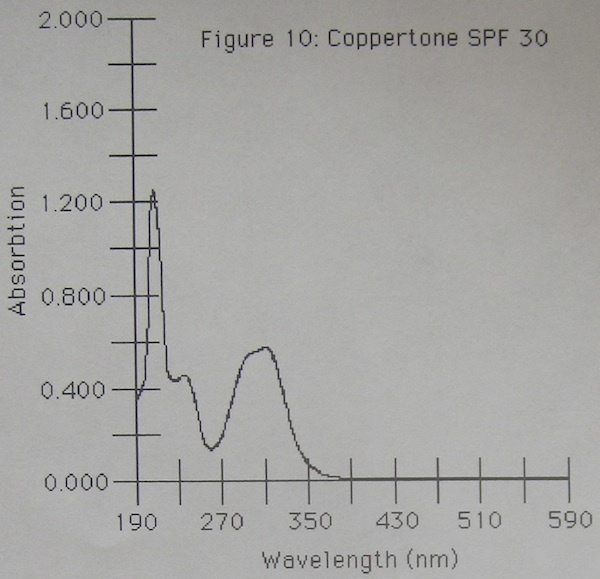 The shape of the absorption spectrum is valuable in recognizing the areas of highest and lowest absorption, and different shapes can represent the effects of different molecules. The precise value of each peak and valley in the spectra is calculated to facilitate further analysis. One of the most important relationships in the analysis of the effect of concentration upon absorption is Beer's law. It states that the absorption is directly proportional to the concentration and path length, when absorption is evaluated on the logarithmic scale. This is represented by the relationship A= Εlc, where "Ε" is the extinction coefficient, a constant for each individual substance, "l" the length of the path of absorption, and "c" the concentration. The extinction coefficient is in fact equal to the slope of the line of best fit on an absorption vs. concentration graph at a given wavelength. Note: With the exception of Phase 4, all experiments were conducted with the Ombrelle SPF 15 sunscreen. 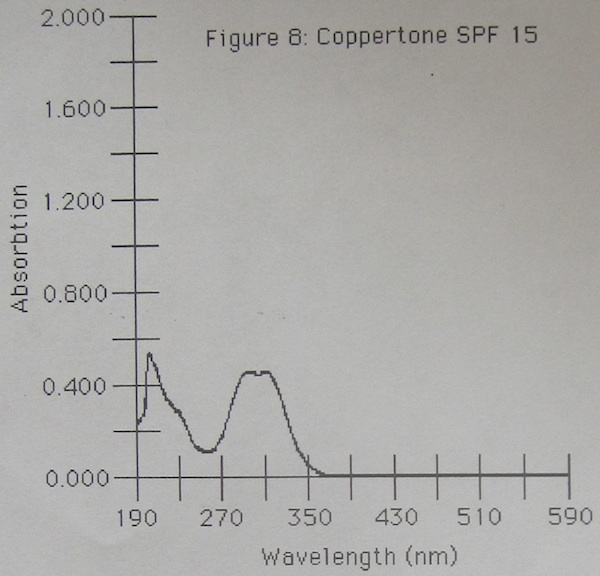 All optical absorption spectra were aquired at a scan rate of 200 nm/min over a spectral range of 190 to 590 nm. The sample cell in which the solutions were analyzed had an optical path length of 1 cm. What is a suitable solvent, i.e. one in which the sunscreen will fully dissolve? What is an appropriate concentration for spectral analysis? The most practical method of conducting spectrophotometric analysis on the sunscreens involved dissolving the sunscreens into solution. This presented the task of discovering which solvent(s) would be most appropriate. A range of solvents from water to alcohols, acetone and CCl4 was tested. 0.10 g of sunscreen was dissolved in 2.0 mL of each and the solutions were inspected visually. Then, using the best solvent, a range of concentrations of the solution, obtained through dilution, was analyzed with the spectrophotometer to obtain a suitable concentration for further analysis of the spectral curve. Distilled water: Opaque, milky white mixture. There was no evidence of dissolution, in fact it appeared the sunscreen had merely been diluted. Ethanol: There was some dissolution, but a fair number of particles were still evident in suspension. Acetone: No visible dissolution, the sunscreen amassed itself in clumps and clung to the inner walls of the container. Carbon tetrachloride: No visible dissolution, the sunscreen clung to the insides of the container. Methanol; A fair amount of dissolution occurred. Some particles remained in solution. lsopropanol: The sunscreen was completely dissolved. Isopropanol provides the best solvent of the six tested. It dissolved the sunscreen quickly and completely. 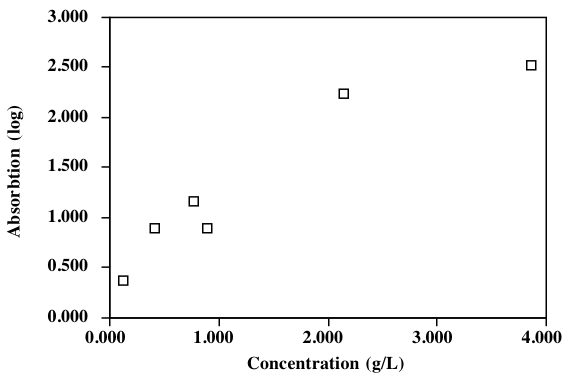 When lower concentrations are involved, methanol would be an adequate substitute. It has a lower saturation point but that would only come into play when relatively large amounts of sunscreen are required. 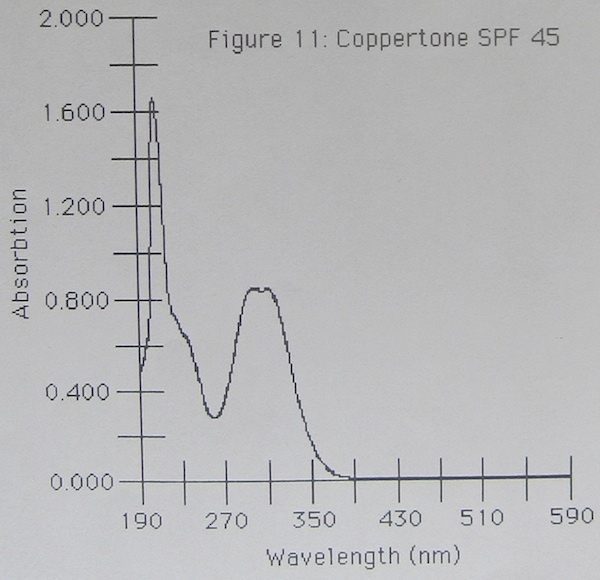 Of the three concentrations of solutions tested, the one of approximately 0.05 g/L proved to be the most appropriate for spectral analysis due to the presence of the entire spectrum on the scale. (see Fig. 3) This is valuable knowledge for the preparation of further solutions. Furthermore, the fact that higher concentrations of the solution, such as 50 g/L, virtually blocked out all ultraviolet rays provides promising data on the effectiveness of sunscreens. (see Fig. 3) The most concentrated solution absorbed at least 99% of the UV rays at every wavelength, which would indicate that sunscreen in its pure form would be a potent protector indeed. What is the relation of concentration to absorbtion in the sunscreen? Does this relationship obey Beer's Law? A series of six different masses of sunscreen was measured on the balance. Each of these samples was dissolved in 10.0 mL of isopropanol. These samples were then analyzed with the spectrophotometer, and graphs of absorption vs. concentration were plotted at specific wavelengths. These graphs were obtained by gathering data points from the initial spectra at a constant wavelength. The wavelengths of 255 and 290 nm were chosen because they represent a peak or valley which was present on each spectrum. At 290 nm, the relationship was of a parabolic nature, which would indicate some manner of deviation from Beer's law. However the more linear relationship at 255 nm is inconsistent with the previous data, which indicates that the results of this phase were probably flawed. The possibility exists for a substance to exhibit either a linear or parabolic relationship of absorbtion with respect to concentration, but not both types of relationship. It is likely that the error inherent in measuring such small quantities of sunscreen was too great to provide useful and accurate results. The problem is the same as in the previous phase on concentration, but it has the added question of discovering if the first series of results was flawed or if those relationships were normal for this system. In addition, do different solvents affect the relationship of concentration to absorption? Two initial solutions of sunscreen were prepared, one with methanol as the solvent and the other with isopropanol. These solutions were then diluted by various factors to obtain a series of solutions with different concentrations. Each of these solutions was then analyzed with the spectrophotometer. 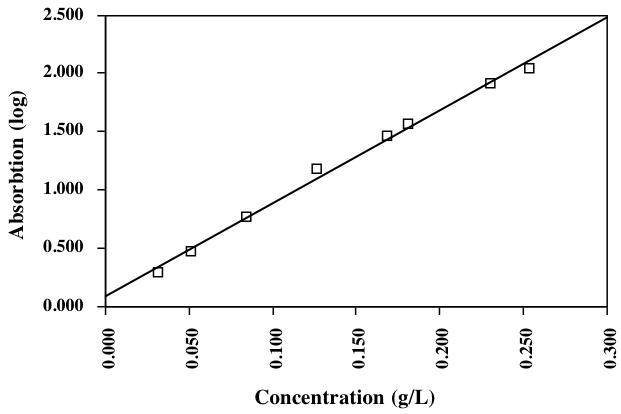 and two graphs of absorption vs. concentration were constructed: one of the methanol solutions and one of the isopropanol solutions. The results indicate that the relationship between absorption and concentration is a linear one. This suggests that the first method to determine this relationship was flawed, as was earlier suggested. The inherent error present when measuring small masses, ie < 1 mg was compounded by the first method, but eliminated by the second and replaced with more accurate dilution. This data provides further support for the effectiveness of sunscreen. The data from phase one indicated very high levels of absorption, and the fact that the increase in absorption at higher concentrations does not slow down suggests very high levels of absorption can be achieved. 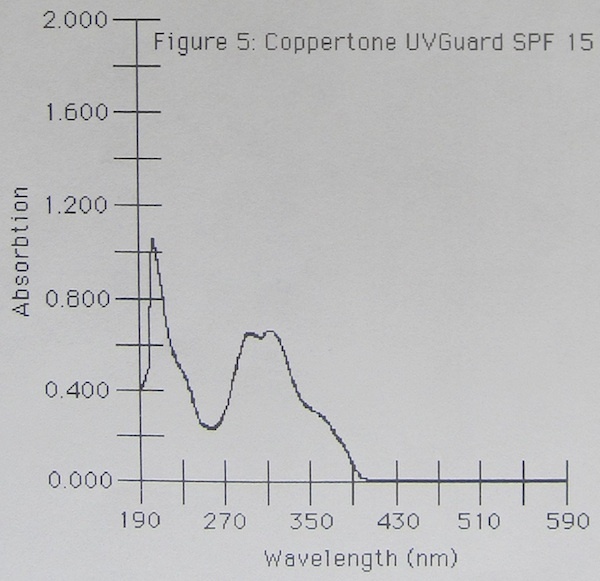 The fact that the two solvents yielded curves with different slopes raises some questions as to the interaction between solute and solvent in the absorption of UV rays. Since the methanol solutions had a higher absorption it is feasible to believe that the two different solvents interact differently with the sunscreen. What does SPF really mean? How do different SPF values relate to each other? ls there consistency among SPF values of different manufacturers? Masses of sunscreen in the range of 0.50 mg to 5.00 mg of various SPF's and manufacturers were measured out. These quantities were then dissolved in a volume of isopropanol appropriate to obtain a constant concentration of 0.05 g/L. Each of these solutions was then analyzed with the spectrophotometer. 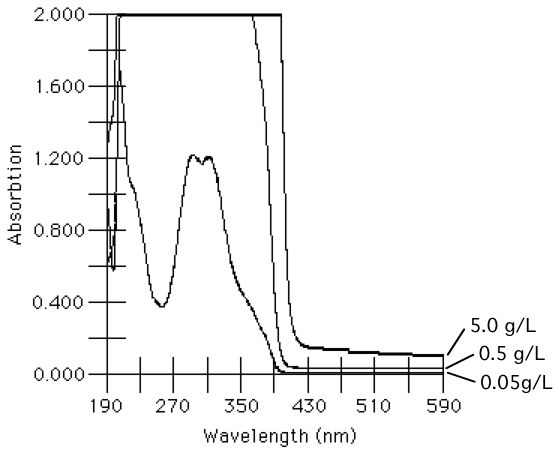 The absorption spectra for the solutions in Table 5 are presented as Figures 4 through ll. 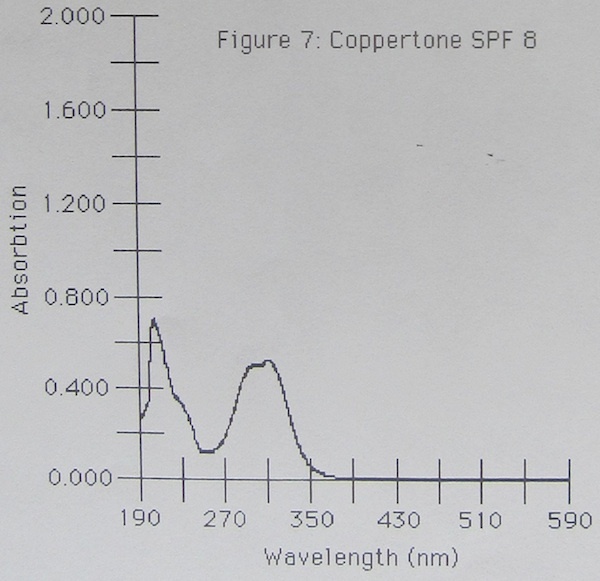 According to these spectra, the SPF value, does not reflect a direct numerical correlation. The spectra which resulted from these samples also provided a great deal of information about the effect of the individual active ingredients in sunscreen. 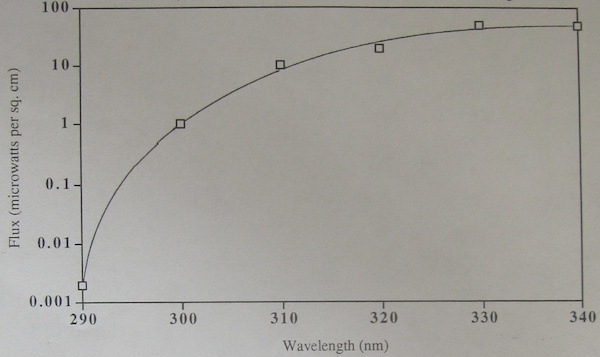 When contrasted on a table, and then crossreferenced to the spectra, it is possible to ascertain which ingredients have the greatest effect at which wavelengths. 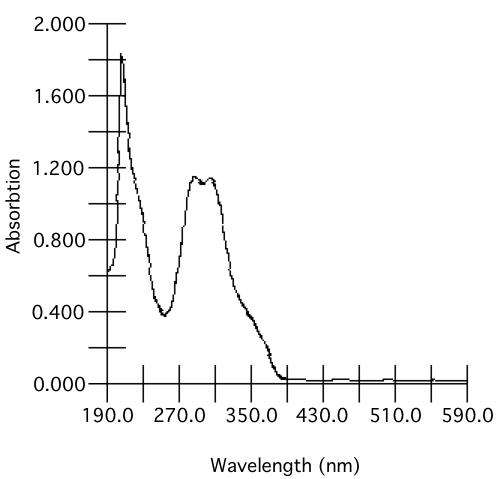 Parsol 1789's effect can be traced to the appearance of an extension of the second major peak in the spectrum. (See Fig. 4 and 5) These are the spectra of the only two sunscreens which contain Parsol 1789, and are the only spectra to exhibit the characteristic extension. 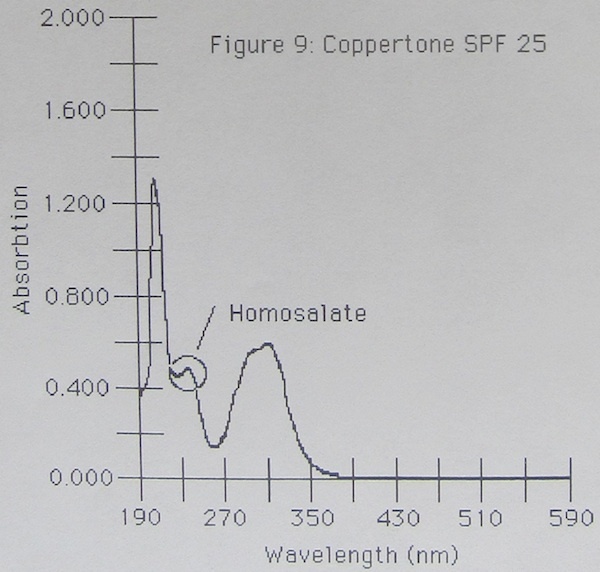 Homosalate's introduction into a sunscreen caused the appearance of a secondary peak in the UVC region. (See Fig. 9 and 10). 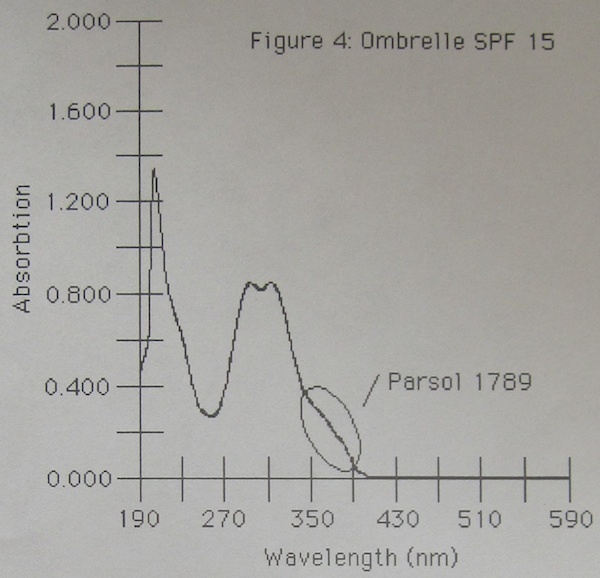 As in the case of Parsol 1789, only the sunscreens containing homosalate exhibited this trait in their spectra, such that no other ingredient can be responsible. In regards to the other ingredients, there is too little information to reach specific and definite conclusions on their effects. (see Fig 4 through 11) However, it has been determined that none of them absorb effectively in the UVA region, and it can be assumed that they operate in conjunction with one another to provide UVB and UVC protection. Most significant though was the ingredient Parsol 1789, which absorbed in the UVA region. It was the only ingredient which absorbed significantly at those wavelengths, and would thus be a valuable part of any wide spectrum protection. Even more important though was the fact that it was in only 2 of the sunscreens tested, Ombrelle and Coppertone UV Guard. How does the laboratory data on sunscreen absorption relate to it's absorptive capabilities for daily usage? Using a balance, a number of samples of 0.1 mL of sunscreen were measured for mass. A density was then calculated from the average of these numbers. Human subjects were each administered a 0.1 mL sample of sunscreen and asked to spread it over an area of the skin which they would consider proper. An imprint was then made of the region covered, and its area measured by computer. The whole process was repeated another two times, and the mean of all the areas was calculated to be referenced against the concentration data. This must then be correlated to the cells employed in the spectrophotometer, which had a path length of one centimeter. Therefore, each of these 3.77 mg would be equivalent to being spread over an area of 1 cm2 and then dissolved in one mL of isopropanol or methanol. Their concentration would be 3.77 g/L. Applying the formula A= Εlc allows one to discern the absorption at the specific wavelength at which concentration graphs were calculated. Do sunscreens truly protect from the sun? Ultimately, the answer is yes, but the reasoning is by no means simple. First of all, the spectrum of absorption must be addressed. It was discovered that of the sunscreens tested, all of them provided adequate protection in the UVC and UVB regions. These wavelengths have long been associated with burning and melanomas, so they have been protected from for many years. Unfortunately, it is only recently that the UVA region has come under suspicion for having harmful effects on the skin.1 The results of this are quite simple, very few sunscreens absorb all of the wavelengths associated with this region. 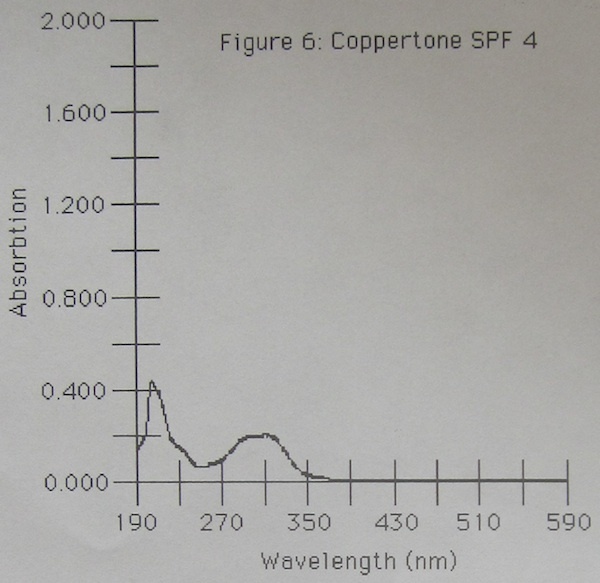 Of those tested, the entire basic Coppertone line, regardless of SPF, absorbed only to approximately 380 nm, while wavelengths all the way up to 400 nm have been discovered to cause cancer. The only sunscreens tested which protected up to 400 nm were Ombrelle and Coppertone UVGuard, both of which contained the ingredient Parsol 1789. For this reason only these two sunscreens can be considered as adequate protection against skin cancer, though any sunscreen with UVB protection will protect against simple burning. Furthermore, the SPF of sunscreens must be addressed. The CDA only supports sunscreens which bear an SPF factor of 15 or higher, and this paper supports that movement. Lower SPF factors can provide a good degree of protection, but for any extended use they will only provide a false sense of security. On the subject of higher SPF's, it was concluded that they are unnecessary to provide adequate protection. 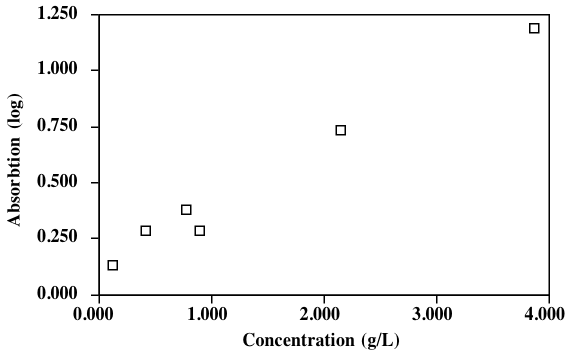 Indeed they do absorb substantially more at low concentrations in solution, but in concentrations such as those found on the human skin the difference is negligible. This conclusion contradicts the guidelines set up by the CDA for the necessary effectiveness of sunscreens bearing certain SPF's. These guidelines suggest that an SPF 15 would absorb a minimum of 93% of the UVBI rays. However, this is only a minimum, and is was discovered that in actual fact the sunscreens absorbed a great deal more than 93%. in fact well over 99%. In an effort not to cheat the consumer, manufacturers of sunscreen have undoubtedly exceeded the necessary guidelines. In fact, due to this excess, SPF 25 and 30 of the Coppertone line turned out to be the very same substance. Each contains the same active ingredients in the same percentages, which raises the next issue about sunscreens: consumer awareness. In the purchasing of sunscreens, one must be aware of all of the above information. The abilities of a sunscreen, as printed on the front of the bottle, are subject to interpretation. If a product advertises UVA protection, it is still necessary to examine it for Parsol 1789. UVA protection does not necessarily mean the full spectrum. In fact, the basic Coppertone line advertised UVA protection but did not provide safety comparable to the sunscreens which did contain Parsol 1789. Furthermore, examine all of the ingredients. Do not be enticed to buy SPF 30 over SPF 25 since they are both the same, buy whichever is less expensive. Another issue which must be addressed is the depletion of the ozone layer and it's relevance to skin cancer and sunscreen. The changes in the ozone layer will in fact have a much lesser effect on the incidence of melanoma than might be suspected. This is because ozone absorbs significantly on_ly in the UVB and UVC regions, not UVA. A large portion of skin cancer cases will always be a result of UVA radiation, which has never been substantially protected against by the ozone layer. While this can be interpreted to suggest that there is no greater risk of skin cancer now than before, which is partially true, it must not be interpreted to mean that sunscreen is not needed. In fact it is just as important as ever, but until recently ` the danger of UVA radiation was not recognized. Furthermore, the depletion of the ozone will have an effect on the speed at which one's skin burns. Even seasonal fluctuations in the ozone layer can alter the percent transmittance of UVB light at any one wavelength by as much as a factor of 10 (see Graph 1). The bottom line is that sunscreens are indeed a valuable source of protection against the sun. However, one must be prudent and wear only an SPF of at least fifteen, and a sunscreen which includes the ingredient Parsol 1789. Perhaps in the future any sunscreen available will be adequate, but until that time it is up to one's self to get the best sunscreen possible. Grist, Eleanor; Setlow, Richard B.; Thompson, Keith; Woodhead, Avril D.. "Wavelengths effective in induction of malignant melanoma." Proc. Natl. Acad. Sci. USA, July, 1993, vol. 90, pp. 6666-6670. Zurer, Pamela S.. "Researchers Lack Data on Trends In UV Radiation at Earth's Surface." Chemical and Engineering News, July 26, 1993, pp. 35-37. Boehm, Bob. "Fending Off Those Harmful Rays: Sunscreens May Give a False Sense of Security, Scientists Say." Journal, June 21, 1993, p. A1, A7. Crutzen, Paul J. "Ozone." Encyclopedia Americana; Deluxe Library Edition, Volume 21, 1991, p. 171. Dean, John A.; Merritt, Lynne L. Jr.; Willard, Hobart H,. Instrumental Methods of Analysis. New Jersey: D. Van Nostrand Company Inc., 1965. "Skin." Encyclopedia Americana: Deluxe Library Edition, Volume 25, 1991, pp. 1-2. Strobel, Howard A.. Chemical Instrumentation: A Systematic Approach to Instrumental Analysis. Reading: Addison-Wesley Publishing Company Inc., 1960.